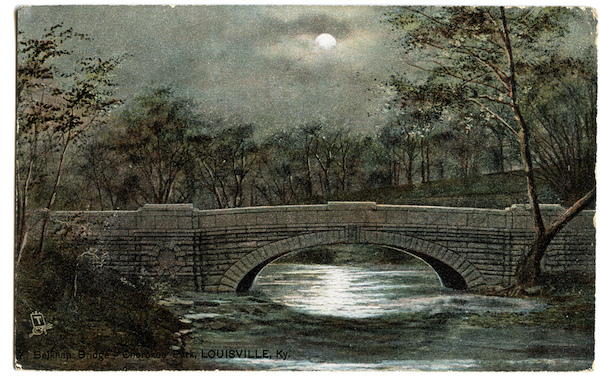 These are two adjoining parks, among the five in Louisville designed by Frederick Law Olmsted. 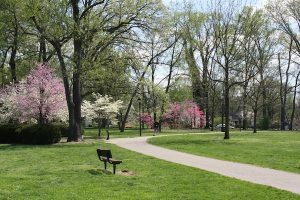 The running highlight of popular Cherokee Park is the ‘Scenic Route’, a 2.4 mile long path through the center of the park. This loop shows off Cherokee Park’s scenic rolling hills, open meadows, and woodlands. The path features separate lanes for vehicle traffic and recreational users. Those looking to lengthen this loop can add in Baringer Path (0.6 miles) or Willow Pond Path (1/3 mile). For a longer run, combine with 520 acre Seneca Park, which has a 1.2 mile walking path (called ‘Scenic Loop’) and a 3.1 mile cross country path. There’s also a golf course, and facilities for many other activities. Also nearby is Rock Creek, where you can run another few km on grass. The area connecting Seneca park to Cherokee Park is also nice for running. From Seneca Park, it’s 1.5 miles, along the parklike Seneca Park Rd. and Beargrass Rd. Add-On: Beargrass Creek Greenway, just east of Cherokee Park, runs for 1.5 miles east of Cherokee Park, paralleling I-64.